Very easy to use and customize.A little problem with listing multiple events in one day but overall a very good product.Would recommend. I've read reviews where someone had an installation problem and a few more where they had trouble running the program. There is absolutely nothing hard about opening your CD or DVD drive, dropping in the CD and following the instructions on which installation you want to proceed with. It's child proof! And once the program is loaded on your harddrive, it's absolutely one of the best program's developed for the PC. The only thing still missing from the earliest version of Calendar Creator that I miss is the individual pics of the moon-phases with the discriptsion underneath. I wonder why they haven't brought that back, since most calendars you see have the pics of the moon-phases. Can export to PDF ! 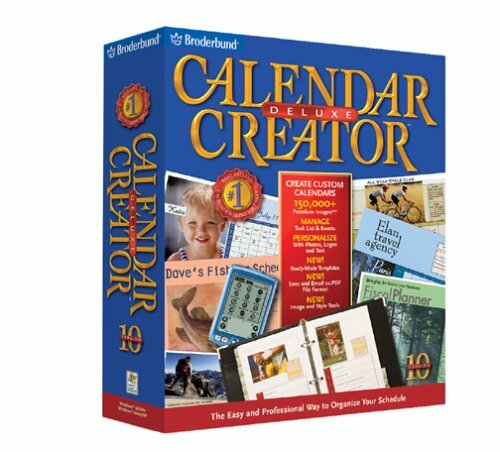 I've happily used several versions of Calendar Creator at home. I choose a different category/color for displaying each family member's appointments, so it is easy to see who is busy at a glance. The repeating events algorithm is very powerful. I upgraded from 6 to 7 when Broderbund added the capability to drag & drop events from one cell to another. Contrary to another reviewer, I CAN move events using the drag and drop method or by using the Cut/Copy/Paste capabilities. In 2004 we switched from 7 to 10 as soon as we found out that Deluxe 10 can export to PDF.This is fabulous!I still print out a multi-week calendar for our refrigerator, but now I ALSO export it to a PDF file and then email it to my spouse at work, so he remembers what's up. We installed version Deluxe 10 on a Windows XP machine with no trouble. Watch out if you want to integrate this with your Palm Pilot. I wanted to sync the Calendar Creator calendar data with my Palm, but keep the Palm address book.This is not possible. For versions 6,7,8,9, and still for 10 you have to use BOTH the Calendar Creator calendar and address book or NEITHER.Therefore I don't put calendar data onto my Palm.It wouldn't mesh perfectly anyway because the Palm calendar a) has a less sophisticated repeat algorithm and b) doesn't use categories. Terrible, terrible, terrible. Good luck placing a photo of your own into this thing. And once you do go look at the print preview - what happened. Total crap. AnyTime Deluxe allows you to organize all of your activities. Keep track of your calendars, schedules, to-do lists, addresses, and notes. 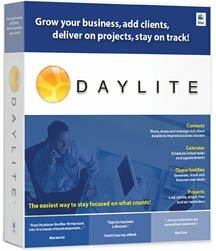 Whether you're at the office, at home, or on the road, working alone or in a group, AnyTime Deluxe is a flexible and easy-to-use organizer. Manage and prioritize tasks, check off items as they are completed, and sort by due date or priority. A new feature allows you categorize and view all to-do items from one location. Use the calendar management features to schedule all appointments, events, and meetings quickly and easily. For repeating events, schedule regular meetings, monthly events, holidays, birthdays, and to-do items with just one entry. Even set alarms and reminders so you're never late and never miss another appointment or deadline again. We have owned this product in Versions 7 and 9 for our law office for several years. 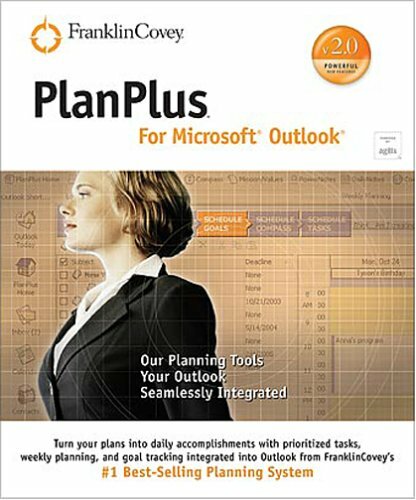 If you need for more than one user to access the program simultaneously, as we do in the office, the program networks seamlessly.You could pay a fortune for a multi-user calendar like this from other vendors. If you have more than two users needing access, you can buy a license. I have seen many complaints in these reviews about technical support; I have e-mailed a couple of times and received a thorough response within 24 hours. 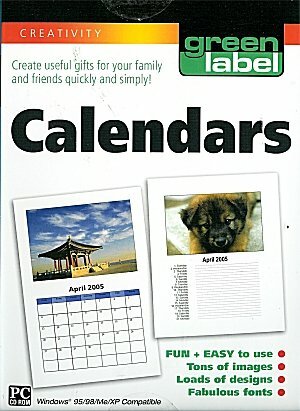 The interface for the calendar and address book is easy to use. I highly recommend the program because of features, ease of use, and price. Have been using this (actually version 9) for a week or so.It seems to do everything you'd want, and is very similar to the paper day-timer I used years ago. 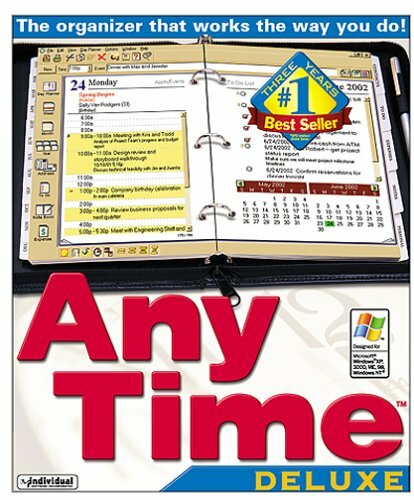 Anytime Deluxe 9.0 sounds good for the money.Mine quit working on WinXP after 2 days, and tech support did not reply to my complaint for over a week, when I was given the address to their FAQ page.It contained no helpful information. After calling them, the tech support person admitted there was a problem, and had me modify my registry.The software ran for about 2-3 days, and then stopped working again.I have called and written emails and tech support has not responded in over a week.Even at its best, the software is mediocre - so save your money and buy some software that works and that the company will support. I bought Anytime because I already had version 2.0.I liked the earlier version, but many of the things the older version had were either missing or less user friendly in 8.0.I couldn't load the files from version 2.0 directly into the new, (fortunately the old computer is still running so I could manually copy one to the other. )The entry process had a lot of unecessary steps which slowed down the process.Version 2.0 reminds you of missed date entries, the new one doesn't. The version 8.0 has a lot of bells and whistles, like fax/cell/watts numbers, direct connection to e-mail, and a few others.The technical assist to Anytime is non-existant, either by 3 no-responce e-mails or 45 minutes on the phone.I'd stick with version 2.0 if you can load it into your computer, otherwise stick with Outlook. 1.) Does not export to ACT, even though the product claims it will. 2.) Does not allow you to import from one database you created into another. 3.) Does not support contacts/addressbooks stored on a shared/network drive. If you have an Exchange or Domino server you will need to create a local file to store your contacts. 4.) 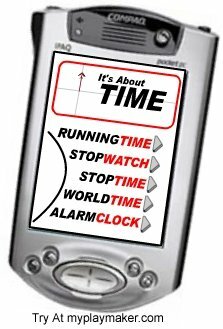 Could not get synchronization to work with two pocket PCs, and one Palm OS device. 5.) character recognition accuracy is really poor for cards that have a dark background or pictures. The only plus is the hardware's small footprint. It is also a twain based color scanner which you can use to scan in old pictures.